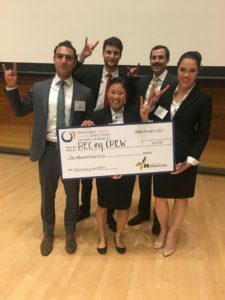 ANN ARBOR—Texas MBA students Ryan Fager, Taina Tebaldi Lajara, Jonathan Painley, Kathleen Gill and Arron Calvache, MBA ‘19, placed second at the 9th annual Ross Renewable Energy Case Challenge held on December 1st, 2017 at the University of Michigan. After three rounds, they beat teams from 14 of the nation’s top business schools, finishing as runners-up to The University of Chicago Booth School of Business. The team acted as the sustainability team for a medium-sized, privately-held health foods company tasked with creating a plan for the firm to meet its goal of procuring 100% of its electricity from renewable sources by 2030. The energy procurement options involved unbundled RECs, green tariff, VPPAs and on-site generation. The team mixed on-site generation for the headquarters location and a VPPA with a wind farm in Texas, to maximize the company sales with a marketing campaign. McCombs’ CleanTech Group is working to ensure that McCombs name is at the top of energy discussions on a national scale.